Thoroughly rinse and clean chicken breasts before handling other ingredients. Place chicken breasts in glass casserole dish. Coat chicken with olive oil. Add brown sugar, pepper, onion powder, garlic powder, minced garlic, paprika, cumin, red pepper flakes, and onions to chicken and mix until chicken is well coated. Cover casserole dish with lid and bake for 30-40 minutes or until chicken is cooked through. Heat BBQ sauce over medium-high heat on stovetop. Add chicken to BBQ sauce and stir. Let simmer for 4-5 minutes. Turn oven on low broil. 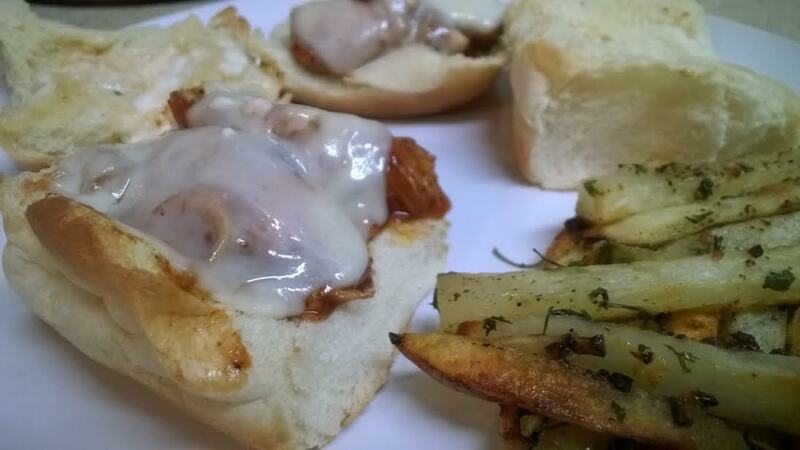 Pile chicken onto dinner rolls/slider buns and top with one slice of provolone cheese. Cook on broil for 1-2 minutes or until cheese bubbles.